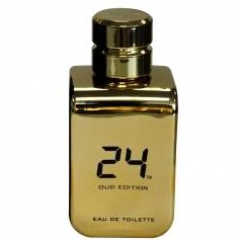 24 Gold Oud Edition is a popular perfume by ScentStory for women and men and was released in 2013. The scent is sweet-woody. Projection and longevity are above-average. It is still in production. I accidentally saw the perfume in a Youtube video from @jeremyfragrance. I do not always share his opinion am also the one or other time on his tip fallen in. A blind purchase was not recommended to me with the 24 gold thus I was also somewhat skeptical with this. I ordered 24 Gold Oud, and when he arrived I was very surprised ...It's a very good performance perfume that's a bit dirtier than his brother. The Sillage is impressive. In fact, it can beat some more expensive niche fragrances in it. If I had to compare it to other perfumes, it would be a mixture of "1 Million" Paco Rabanne, "Spicebomb Extreme" Viktor & Rolf, some vanilla of "24 Gold" and a good oud note. The composition contains notes of mandarin, pepper, cinnamon, sandalwood, vanilla and oud... The bottle is a small golden block that is not special. Like the 24 gold only a little darker. Durability and Sillage are above average. A good 24 hours...Very suitable for the cold season. Be careful, though, in enclosed spaces. But what bothers me (I just mentioned that) is the vanilla note. I didn't like One Million back then either. I ordered a bottle and gave away more than half of it because I couldn't smell it anymore. And a similarity is well known. Write the first Review for 24 Gold Oud Edition!